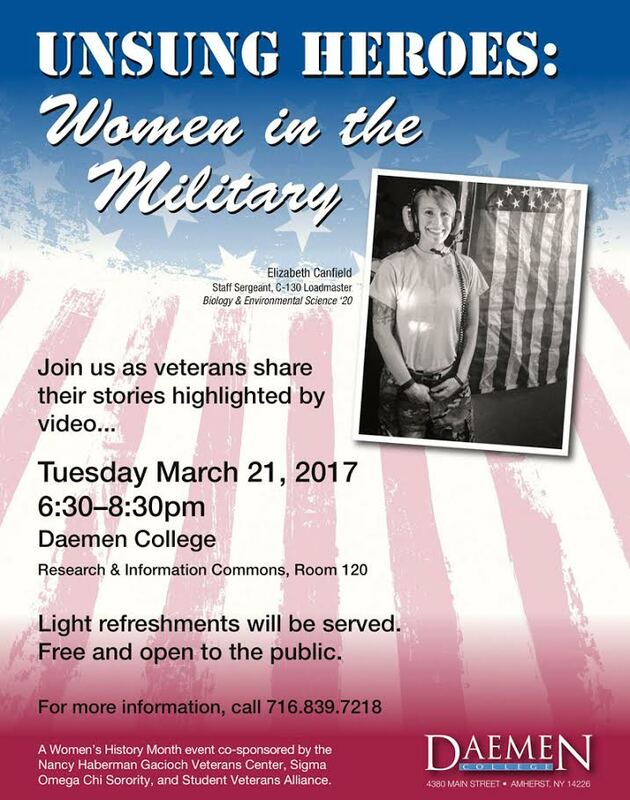 On Tuesday March 21st,2017 the Daemen College Nancy Haberman Gacioch Center for Veterans, along with the Daemen Student Veterans Alliance (SVA) and Sigma Omega Chi Sorority, partnered to host a viewing of the Ron Howard-produced documentary Unsung Heroes: The Story of America's Female Patriots. After a viewing of an edited version of the documentary, the event featured veteran panelists Nerfis Elminowski, ANP-BC, DNP, Col Laureen Barone (ret), Lynn Magistrale, Jennifer Wiese, and current Daemen student Elizabeth Canfield. These ladies led an in depth and enlightening discussion about the vital role of women in the military in the past, present and future. Over 100 people attended, making the event standing room only and a HUGE success! 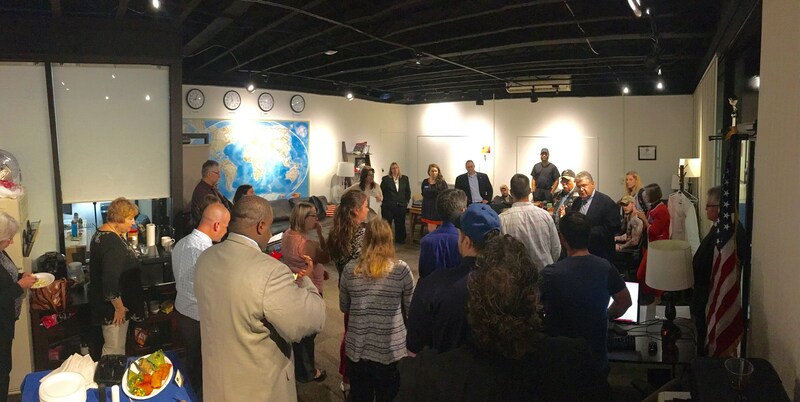 On January 31st 2017, the Nancy Haberman Gacioch Center for Veterans hosted a Do Drop In event to welcome new and returning Military Aligned Students to campus. 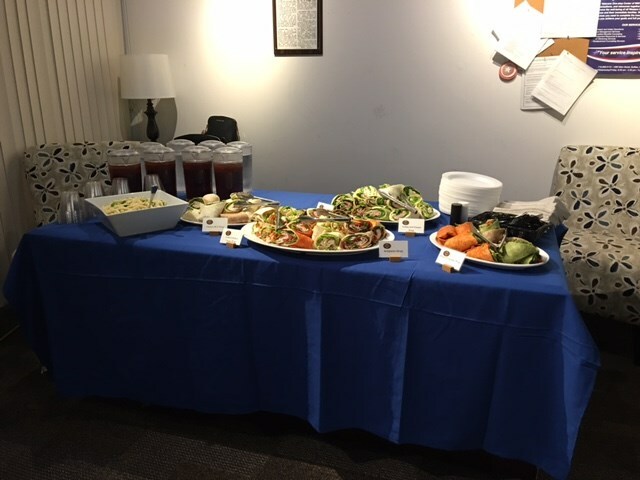 The informal event offered food and refreshments, and a chance for students to meet and mingle with faculty and staff. 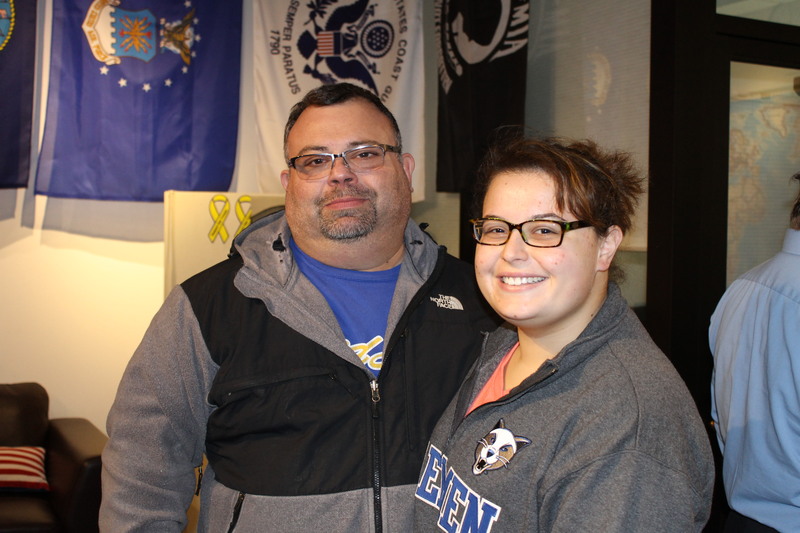 A short meeting was held before the event for officers of the Daemen Student Veteran Alliance (SVA) to share experiences and lessons learned from the SVA National Conference in Anaheim CA during the winter break. Dog Tags of New York was on campus December 8th for a pre exam week visit and stress relief session. The event, hosted by the Daemen Student Veterans Alliance, looked to raise awareness of the importance of emotional-support dogs for veterans, and the positive affect our four-legged friends can have on relieving stress, particularly during the final exam period. The event featured speakers from Dog Tags of New York and their stories of how volunteering and working with their dogs has positively impacted their lives after deployments and helped to combat PTSD after they were discharged. 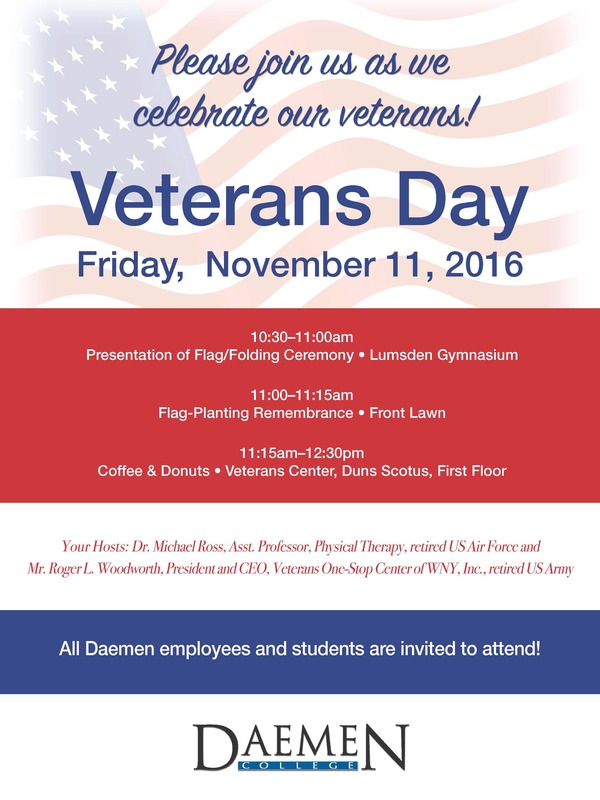 On Friday November 11th, 2016 the Student Veterans Alliance and the Nancy Haberman Gacioch Center for Veterans hosted a three-part Veterans Day celebration for current and past veterans of Daemen College, and for members of the Daemen Community. 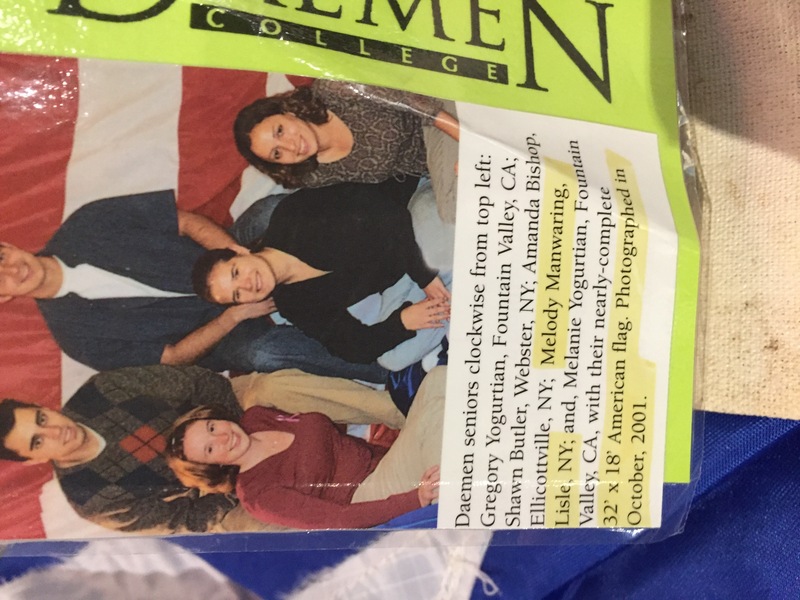 In preparation for the event, a 17 foot by 32 foot flag, hand-made in 2002 by five Daemen students to honor our troops after the 9/11 tragedy, was prominently displayed outside on the Lumsden Gym facing Main Street. While Facilities personnel were installing the huge flag, passers-by were tooting their horns in approval and in support of the day. 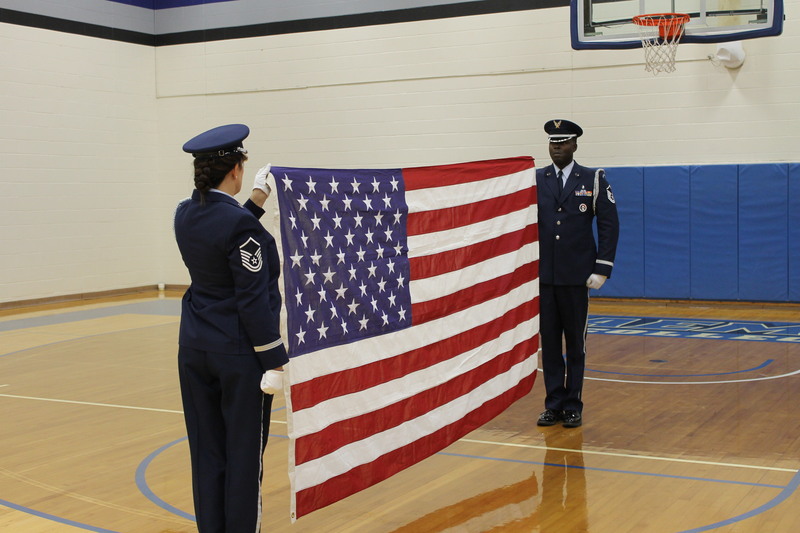 The first event featured a flag folding ceremony performed by the Niagara Falls Air Base Honor Guard as well as a visit and short speech by Buffalo Mayor Byron Brown. 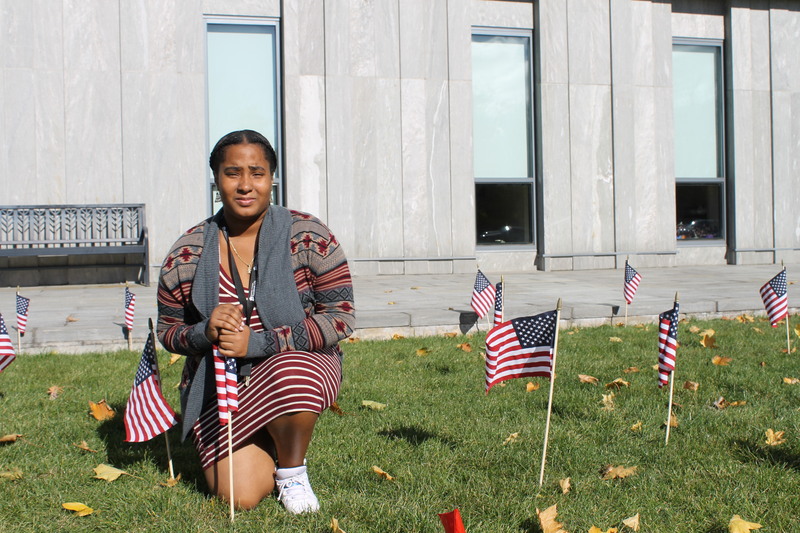 The event then moved outside where Roger Woodworth, CEO of Veterans One Stop, Inc. in Buffalo, gave a brief but poignant speech after which veterans and community members attending the ceremony were invited to plant American flags in front of the Research and Information Commons Building, which also faces Main Street. Following the outdoor ceremony, a third ceremony was held in the NHG Center for Veterans. Frank "Bud" Kowalewski, a member of the first veteran graduating class when Daemen was named Rosary Hill College, presented the Center with a Viet Nam era gift of art in the form of a shadow box containing representative memorabilia from that era including a small motorcycle made by Amer-Asian children from metal scraps. After Bud's touching speech, the gift was respectfully accepted by the officers of the 2016-17 Student Veteran Alliance and will be on display in the NHG Center for Veterans. 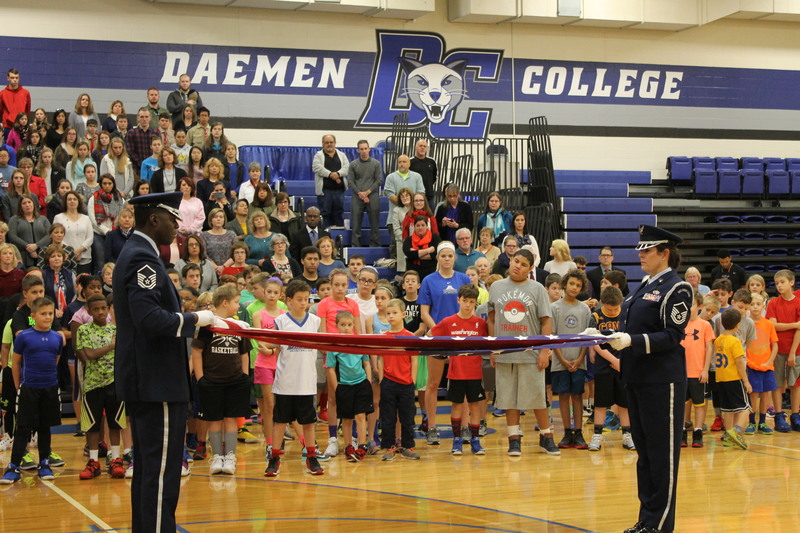 The event was very well attended by faculty, students, alumni, staff, young campers at a Daemen Basketball Camp, and community members including several Boy Scouts! Representatives from US Senator Gillibrand's and NYS Senator Ranzenhofer's offices were in attendance as well, along with reps from Assemblyman Ray Walter's office, County Legislators Ed Rath and Tom Loughran, Deputy Town of Amherst Supervisor Steve Sanders, and Daemen's great friend Nancy Haberman Gacioch. Attendees enjoyed refreshments and conversation in the Veterans Center following the morning events. Thank you to all of the students, staff and community leaders who helped make this day very special! On Thursday, 3rd November at 11:45 am, the Nancy Haberman Gacioch Center for Veterans hosted a reception for Colonel Jean Anderson, who was in town to be honored by Daemen as a 2016 Distinguished Alumna during Homecoming weekend. Colonel Anderson, a Daemen College Physical Therapy graduate, has served in the Army on both active duty and in the reserves. She was instrumental in changing policy allowing all military occupational specialties to be open to women, as well as spearheading programs with the 10th Mountain Division in Fort Drum for instructing a human performance optimization and injury prevention program. She served the US Forces in Europe command as an instructor and was recently appointed as the Chief of the Reserve Component Physical Therapy Section. Col. Anderson's decorations and awards include five Meritorious Service Medals and an induction into the Order of Military Medical Merit. She is also active volunteering with the Boy Scouts, Youth Sports programs and school support organizations. Col. Anderson and her husband have three children. 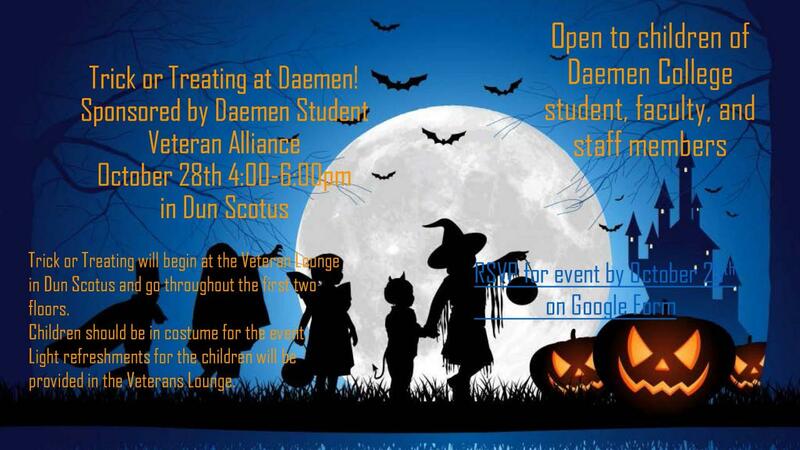 The Daemen College Student Veteran Alliance recently hosted a trick-or-treating event on Friday October 28th. The event hosted students, faculty and staff with children to come out to campus and get some early treats and show off their costumes. The final stop on the trick-or-treating trail was in the Nancy Haberman Gacioch Veterans Center where apple cider and donuts were enjoyed by both the children and adults. Fifteen student organizations and clubs along with campus administrative offices joined in the festivities. Student clubs as well as several administrators dressed up to hand out candy to the little ones at the event. All in all, the wonderful campus-wide support and participant response helped make this event a huge success! On Thursday, 6th October 2016, great friend of the College and founder of the NHG Center for Veterans, Nancy Haberman Gacioch stopped in for a visit with her therapy-dog-in-training, Butter, who made a great impression on everyone! Both Butter and his mistress are welcome anytime in the Center! Who doesn't enjoy getting "buttered up?" First row, from left: Audrey Ogorek, Kayla Guillermo, Jessica Najera-McFarland, and Justine Gauda; row two, from left: Britney Matthews, AJ Fiscus, Dr. Theresa Joyce, Nancy Haberman Gacioch, Kevin Fricano, Joe Helowicz, Pat Smith, Tolbey Jefferies , and Dr. Maureen Millane. And of course, smiling in the center (but looking a little tired) is Butter. Jessica (left) and Kayla (right) saying goodbye to a very tired Butter. Nap time! 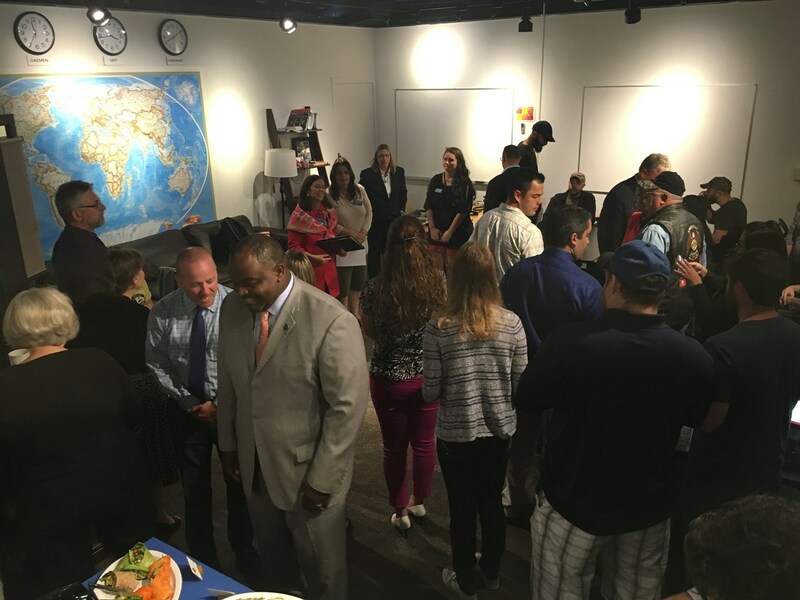 On Thursday, September 15, 2016, the Nancy Haberman Gacioch Veteran Center held an Open House event, welcoming current military-aligned students (MAS) and new students to the Center. Dr. Maureen Millane, Associate Vice President, Office of Community Engagement, led the official welcome to the large crowd and recognized several distinguished visitors including Dr. Michael Brogan, Vice President for Academic Affairs and an Air Force veteran. 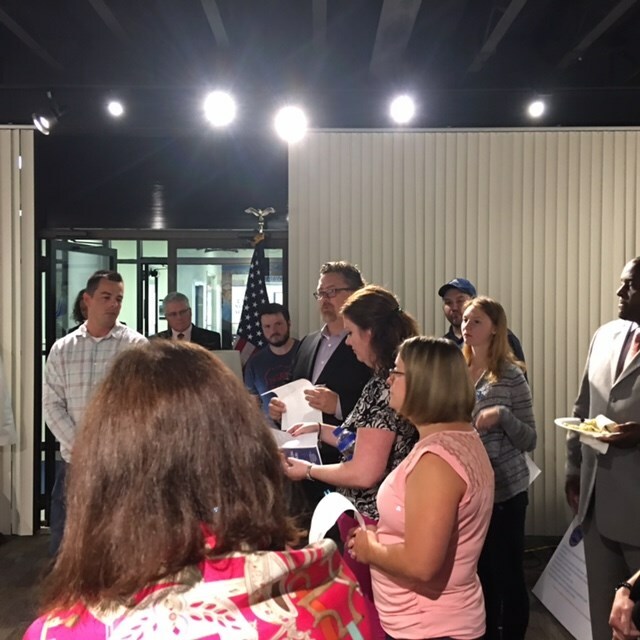 Dr. Brogan spoke about Daemen's continuing commitment to providing support for our military-aligned students while Dr. Theresa Joyce, Coordinator of Veteran Services, introduced the NHG Center's Military Aligned Team of student center office assistants, and student coaches. Several Daemen personnel from key departments, which also provide assistance to our MAS, were also presented to the audience. 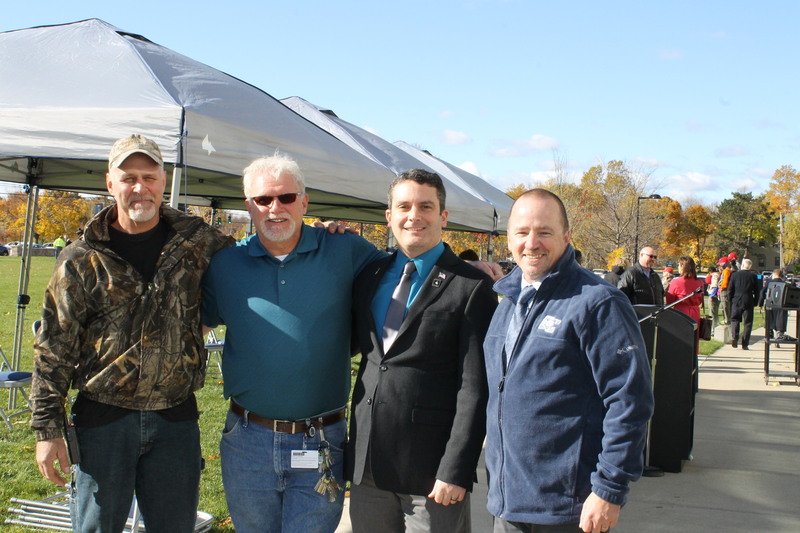 The event featured greetings from Dr. Michael Ross, moderator to the Student Veteran Alliance (SVA), and Mr. Roger Woodworth, President of the One Stop Center of WNY and community liaison to the Center and the SVA. 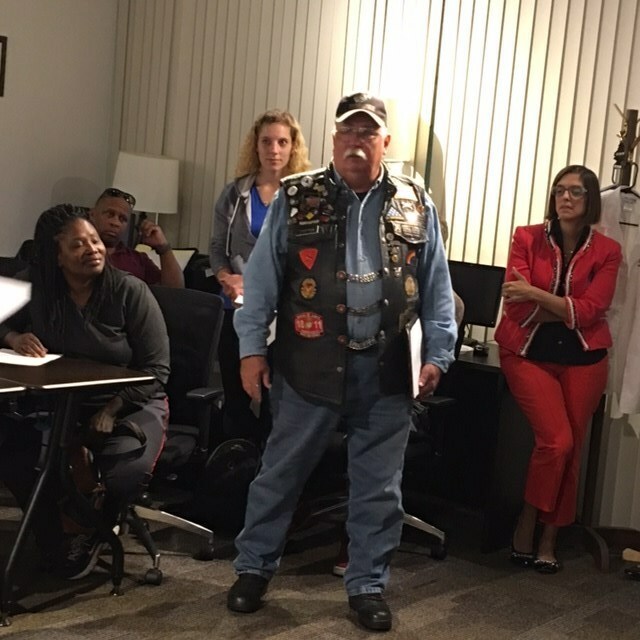 Finally, Mr. Bob Chapman, representing Orchard Park Post 567 of the American Legion Riders, announced the David M. Buyer Memorial Scholarship, which is available to veteran and dependent students. Everyone enjoyed lunch, and meeting the military-aligned students and the MAS team. Dr. Ross describes speaks about the Veteran Student Alliance, of which he is the moderator. Getting to know everyone and learning more about the NHG Center for Veterans from Dr. Millane. Dr. Brogan discussing Daemen's commitment to our military-aligned students.